Mt. Hochtor with its 3 most frequented ridge ascents: Guglgrat to the very left is a marked hiking path, Rossschweif from bottom left has an UIAA rating of II-III, and Dachlgrat, passing over the giant slab at right, has I-II. Dachlgrat on a nice day is regarded as one of the finest ridges in the very eastern alps. The ascents for the serious climbers are found on the steep wall towards the Enns valley (from the dark part downwards). Mt. Reichenstein can be seen to the right. It is an interesting fact that the first ascent party in 1873 included Johann Frischauf, a mathematician at the University of Graz, who is the academic (great)n-grandfather of both organizers. 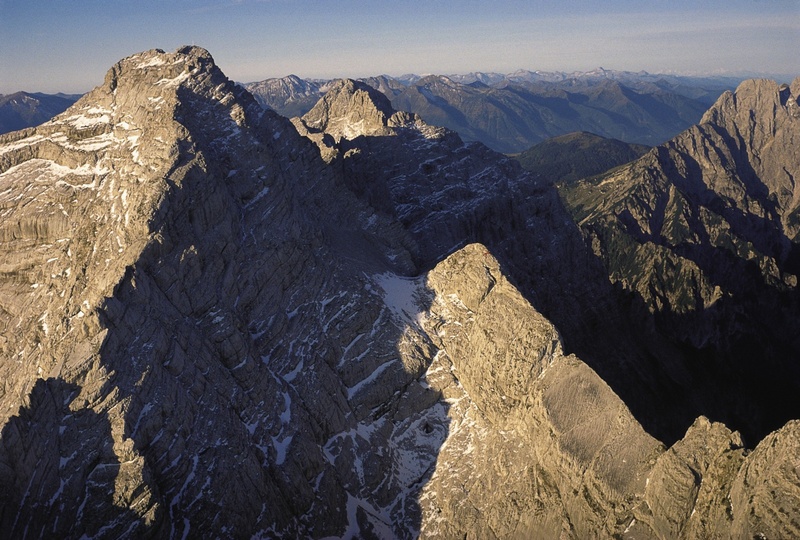 The first ascent of Hochtor has also been attributed to Frischauf, but it is now known that it has occurred much earlier. source: National Park Website. This is an aerial photo.